Some schools in Arkansas are putting up “In God We Trust” signs. Schools across the state are allowed to display framed signs with the words inside classrooms, reported KNWA. However, the condition is that the signs must be donated as opposed to being paid for with public funds. The 222 posters placed into Pea Ridge Schools were donated and hung up in schools across the district. The posters came from the American History and Heritage Foundation. Mark Laster of the Pea Ridge Schools said the district is following the new law. Almost 900 signs in total were provided to Bentonville Schools. “In God We Trust” is the official motto of the United States. However, some people aren’t happy. Others, though, approved the law (pdf), which was originally passed in 2017. The posters or framed copy must include an accurate representation of the United States flag as well as the Arkansas state flag. Public buildings such as libraries are also allowed to display donated posters. 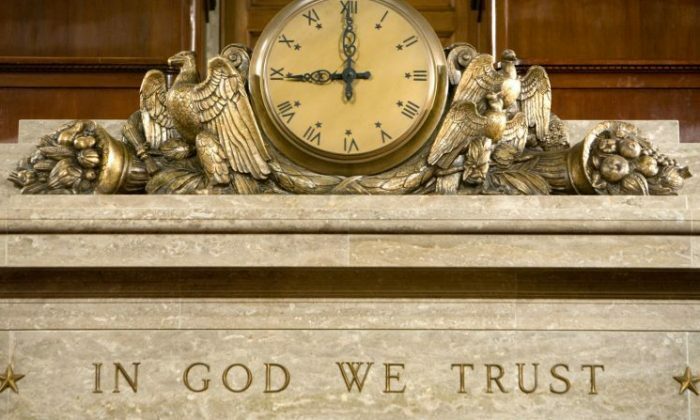 Legislation that would have required all schools in Florida to put up “In God We Trust,” the official state motto, was moving forward for a while but was indefinitely postponed and withdrawn from consideration on March 10.